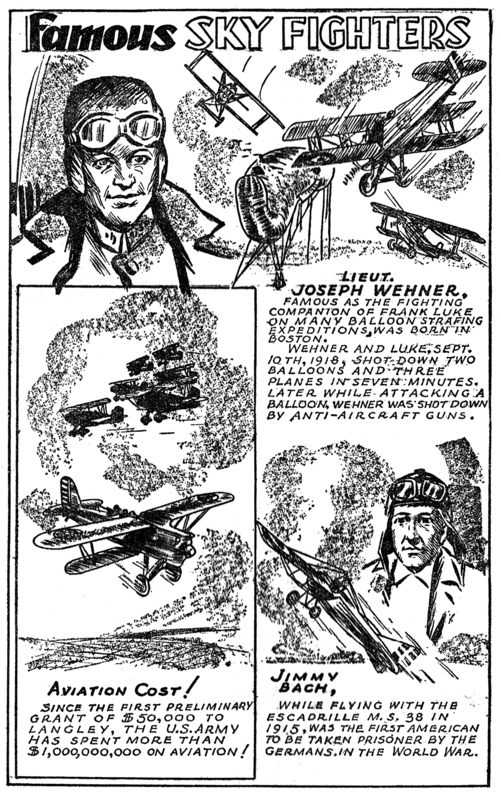 The December 1934 installment, from the pages of Sky Fighters, Features Lieut. Joseph Wehner, Major Gabriel D’Annunzio, and shout outs to Napoleon and Belgium’s Willy Coppens! Next time in “Famous Sky Fighters,” Terry Gilkison features Lieut. Colonel Robert Rockwell, Belgian Ace Willy Coppens and Capt. Clyde Balsley of the Lafayette Escadrille! Don’t miss it! Amidst all the great pulp thrills and features in Sky Fighters, they ran a true story feature collected by Ace Williams wherein famous War Aces would tell actual true accounts of thrilling moments in their fighting lives! 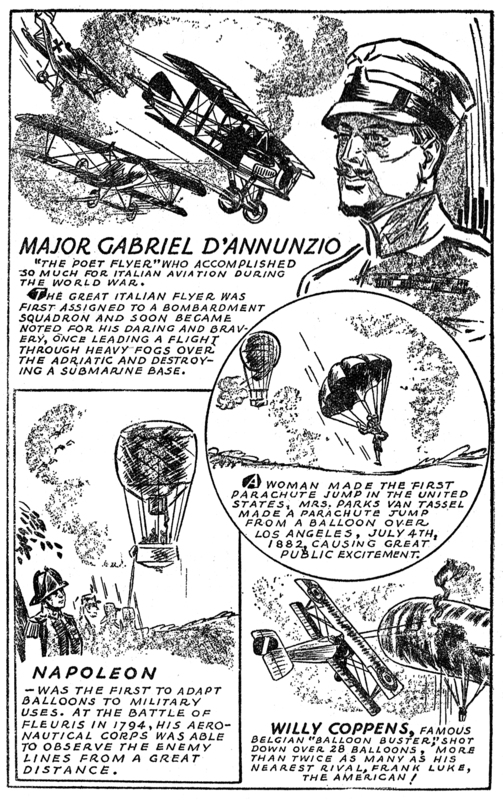 This time it the Italian Ace, Captain Gabrielle d’Annunzio. Captain Gabrielle d’Annunzio, famous Italian poet and dramatist and enthusiastic patriot, was one of the most colorful and forceful of Italian flyers in the early days of the World War. He enlisted early in the most spectacular branch of the army, the Italian Air Corps. 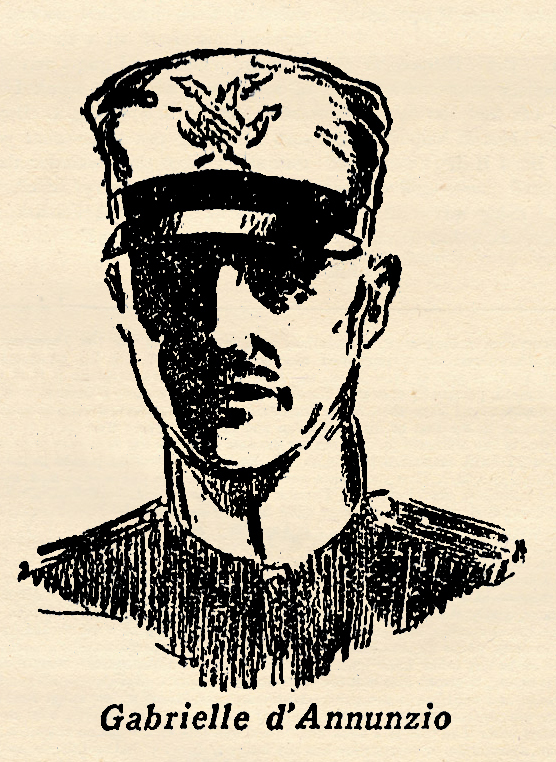 Soon after completing his training he was assigned to a bombardment squadron which was charged with harassing the then fast-advancing Austro-German armies, which threatened to overwhelm the brave Italian defenders and take the capitol at Home. By exerting superhuman efforts the Italians prevented that. The following is taken from reports of newspaper correspondents at the scene of battle. I was nervous on that night. It was to be my first night bombardment flight. I was detailed to blow up an ammunition dump. It was necessary that this dump be destroyed to halt the advance of the victorious Austro-German armies. I was not sure of myself, but my heart bled for my country. I must succeed, I vowed. It was not fear of death that made me nervous, but fear of not being able to accomplish my mission. We took off shortly after midnight. The moon was shining brilliantly on the beautiful Italian hill country over which we were flying. Soon we were across the lines, and the Austrian anti-aircraft batteries opened up. I thought I was high enough to be out of range, but a dazzling red mushroom flare that burst above me made me realize I was mistaken. I tried to climb, then, and nosed up. But my bomber was too heavily loaded and the controls wouldn’t answer. For an instant I was panicky, I swung right and left when the shell began to burst nearer and nearer to me. After a few minutes of that, I saw that I could dodge the shrapnel. The feeling of panic left me. I grew confident and headed directly for my target, which was easily recognized in the shower of moonlight. I sent the bomber down low, through a hail of shrapnel and machine-gun bullets. But I didn’t worry about them. I was over the dump and knew I could destroy it the moment I dropped my bombs. I went down lower and lower to make sure I wouldn’t miss. Finally I let go and zoomed up. There was a brilliant flare that filled the whole sky. Then a terrific concussion that shook my bomber like it was fragile cardboard. But I didn’t care. I was happy. I had accomplished my mission. Whether I returned or not was inconsequential. But I did get back, and safely. I knew then that I could handle a night bomber. I was never nervous about night bombardment any more and I hadn’t failed my country.